During 2018, we looked at a number of important developments that are re-shaping the way IT operates. As we head into 2019, it will be interesting to see how far these developments go. There are four key technologies and processes that we believe will continue to contribute to the ongoing drive for digital transformation. Artificial intelligence (AI) and software-defined networking (SDN), for example, offer new opportunities for the IT team, while processes like DevOps and independent software testing are moving over from the software industry to deliver important quality and productivity benefits. In the data center, we explained how a new approach is needed to manage availability and performance because traditional approaches to IT operations lack the speed and accuracy to maintain the highest levels of customer and user experience. A platform known as AIOps (Artificial Intelligence for Operations) is proving to provide the essential visibility and support for faster and better decision making in IT operations. It can improve IT productivity by eliminating manual monitoring and analysis, enabling teams to streamline workflow and run smarter operations. And it can help IT teams become more agile and responsive, as well as reducing costs by cutting the time to diagnose and resolve incidents, and supporting self-service operations. Looking ahead to 2019, Gartner forecasts that 25 percent of global companies will have implemented AIOps platforms by next year, up from a current level of around 5 percent. 2018 saw rapid growth in the adoption of software-defined wide-area network (SD-WAN) — it’s a technology that’s forecast to double in market size in the coming years. We believe that SD-WAN can help IT meet the challenges of growing levels of mobility, the drive for digital transformation, the increasing dependence on cloud services, and the need to scale resources for the Internet of Things (IoT). SDN-WAN helps network administrators meet these challenges by virtualizing their networking hardware to increase agility, achieve significant cost savings and gain other benefits. The aim is to create a digitally-ready network that can adapt to changing demands. Forrester Research commented recently that cloud migration isn’t just a solution for reducing costs — it provides a platform for turning ideas into great new services. However, we recognize that success doesn’t just depend on moving to the cloud — it also depends on changing working practices. DevOps, a proven process in the software industry, offers important benefits for IT operations. It can accelerate project times, reduce reworking and support innovation by breaking down barriers between team members, increasing collaboration and introducing higher levels of automation. Those benefits can be important for IT teams struggling with bottlenecks, slow infrastructure deployment times and inefficient manual processes. 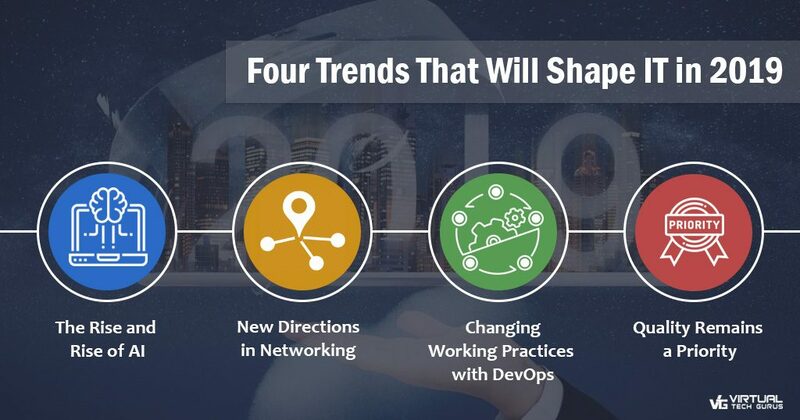 With continuing demand from the business for faster service delivery and increased innovation, we believe DevOps will grow in importance through 2019. While time and budget pressures remain, IT teams also need to maintain the quality of new applications and services. However, businesses are unlikely to have a team of skilled testers on site to maintain the necessary momentum. In-house testers can be costly when hiring, training and salaries are taken into account. Independent software testing firms has proved to offer a cost-effective alternative to in-house testing. They operate as centers of excellence, employing experienced, expert professionals utilizing industry best practice. Businesses can draw on skills, resources and processes that are not available in their own teams. But, the more important benefit is objectivity — independent firms take a completely objective approach to software testing. If you would like to find out more about the way these technologies and processes can help your business in 2019, please check out the articles and infographics on our website. I definitely appreciated every bit of it and I have you book marked to check out new information on your blog.